Florence, Uffizi, Inv. San Marco e Cenacoli, no. 106. Catalogo della Galleria Ferroni, Florence, 1895, 8, 9, as Sarto. Marco Chiarini, in Uffizi Cat., 1979, 439, as Puligo showing the influence of Rosso and related to Puligo’s Portrait of a Youth Writing in the collection of Viscount Gage, Firle Place, Sussex (Freedberg, 1963, II, 222-223). Costamagna and Fabre, 1985, 40, 72-74, with Fig., as by Tommaso di Stefano Lunetti, 1520-1525. Anna M. Manetti, “Nei depositi degli Uffizi c’era un Rosso Fiorentino,” Il Giornale dell’Arte, 64, February, 1989, 41, with Fig., reported its earlier attribution to Domenico Ubaldini and the recent suggestion of Antonio Natali that the picture is by Rosso and done around 1514-1515, an attribution supported by Paolo Barocchi and Carlo Del Bravo, who thought it an early work; Luciano Berti thought the attribution to Rosso should be considered. Natali, in Natali and Cecchi, 1989, 15, as not by Puligo nor by Tommaso di Stefano Lunetti, and as possibly by Rosso. Franklin, “Portrait,” 1989, 842, n. 10, as too carefully painted to be by Rosso, and of the early 1520s as indicated by the costume and hairstyle; he thought the attribution by Costamagna and Fabre to Tommaso di Stefano deserves consideration. Antonio Natali, “Pinacoteca fiorentino: Ritratto di giovane in nero,” Artista: Critica dell’Arte in Toscana, 1990, 104-109, Fig., as (attributed to) Rosso, with comparison to heads in Rosso’s Assumption, as possibly showing a writer, and reporting support for the attribution to Rosso from Barocchi, Berti, and Del Bravo, adding Berti’s suggestion to investigate the possibility that it is a portrait of Francesco Berni. 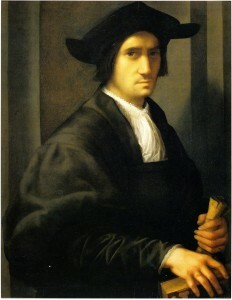 Franklin, 1994, 212, 290-291, n. 16, as not by Rosso, close to Puligo, the costume and hairstyle indicating a date in the 1520s; he seems to indicate that the sitter holds a letter. Costamagna, 1994, 107, n. 2, under Cat. 5, as difficult to sustain as Rosso’s, its background architecture not possible until Raphael’s Leo X arrived in Florence in 1518, and impossible as Rosso’s contemporary with his male portrait of 1519 in Washington; possibly by Tommaso di Stefano. I do not see any relation to Rosso. It is not by an artist of his talent and artistic ambition. The attribution to Tommaso di Stefano Lunetti, as argued by Costamagna and Fabre, is possible, although Natali’s evaluation of the portrait as of finer quality than Lunetti’s work merits attention. It is not clear in reproduction that the sitter holds a book in his right hand. The object in his left hand may be a single rolled up glove, or a pair.